The picturesque town of Gettysburg, Pennsylvania, has a distinguished place in the American tradition of overcoming profound divisions. On the weekend of February 11-12, 2017, it witnessed a remarkable dialog between two distant worlds—the American and the post-Soviet. 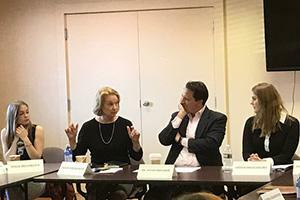 The Eisenhower Institute at Gettysburg College invited students from the Carmel Institute for a weekend of seminars and cultural immersion organized by Ms. Susan Eisenhower, the Institute's Chairman Emeritus. Dr. Anton Fedyashin, Director of the Carmel Institute of Russian Culture and History, and Ms. Eisenhower led the seminars. The meeting of young minds aimed at breaking through the seemingly impenetrable wall of stereotypes that has sprung up between Russia and America over the past few years. Twelve students from Susan Eisenhower's course "Strategy & Leadership in Transformational Times (SALTT)" met ten AU students from Russia, Ukraine, Belarus, and Azerbaijan to discuss misperceptions, conflicting interpretations of history and ways to surmount them. The topics dovetailed perfectly with the Carmel Institute's goal to overcome stereotypes through dialog and educational exchange, as its Founder and Chair of the Advisory Committee Susan Carmel Lehrman intended. Upon arrival in Gettysburg, the AU group toured Gettysburg College on their way to a roundtable lunch with their American counterparts. After a go-around of personal introductions, a lively conversation immediately took off over food and coffee, which set the tone for the next twenty-four hours. After lunch, the students got straight down to business with a two-hour session in which they expressed their observations about their own societies first and then asked each other questions and discussed the similarities and differences in perceptions. There were two take-aways from the first session. First, students quickly realized how different experiences formed their impressions about their own countries and their place in the world. Second, they also realized that dialog prevents those differences from becoming impassable obstacles to respect and cooperation. Gettysburg senior and anthropology major Joseph Recupero summed it up nicely: "I found most interesting the ability to understand how growing up in different parts of the world and different social environments can influence certain underlying opinions regardless of the issue. However, even with these underlying opinions in place, it is possible to converse, debate, and form partnerships for collaboration and improvement." Gettysburg history major Gray Clemenson echoed this sentiment: "We were able to connect very well despite our different cultures and it was a lot of fun just talking about our different cultures." Gettysburg junior and political science major David Corradetti went a step further to argue that variety made for more stimulating exchanges: "Each student brought a different perspective and each student had different experiences which lead to great discussions. The Russian students (and former Soviet bloc students) really are not all that different from Americans. We all have our own personal viewpoints shaped by our experiences." Commitment to dialog defined the first session. Alexandra Smekhova, a Russia graduate student from AU, put it succinctly: "There should be a conversation. Always." After a break and a walk along the cozy streets of Gettysburg, the students met again for dinner and a screening of "Cold War Roadshow," a documentary about Nikita Khrushchev's 1959 trip to the United States. Part of the American Experience series by PBS, the film showcased Moscow's and Washington's attempts at maintaining dialog despite profound geopolitical and ideological differences during the Cold War. The next day's session explored ways to encourage dialog and overcome stereotypes. The students identified the sources of information about each other as partly responsible for misconceptions. As Gettysburg senior and computer science major Aiden Egglin put it, "The sessions helped me to consider US-Russia relations from a different perspective, and to gather news from a variety of different sources before making any kind of judgment." Gettysburg junior and political science and public policy major Giulia DiGugliemo put it thus: "I found it fascinating that the rhetoric provided by the education systems in both countries about the other country was so slanted or shortened. It is very telling." One way out of the echo-chamber of mutual stereotypes, according to the students, is direct dialog. Alexandra Smekhova argued that "society in general is ready to cooperate, so should the countries be." Gettysburg junior Julia Kerr suggested that "if our governments could have similar talks to the ones we had, there would be greater respect and understanding between the US and Russia." Students from American University and Gettysburg College trade knowledge about their respective countries. After the session, the students visited the Eisenhower National Historic Site—the home and farm of General and President Dwight D. Eisenhower. Susan Eisenhower personally led the tour through the museum and house and shared her reminiscences of Khrushchev's visit there in 1959. The Russian students then took an extensive tour of the Gettysburg Battlefield and visited the cemetery where President Abraham Lincoln gave his famous address—a fitting end to an intellectually stimulating weekend in an historic American town. Yulia Melnikova, an exchange student from the Moscow State Institute of International Relations noted that "so far, the trip to Gettysburg has been the first and most fascinating experience of mine in the USA. The fact that we could agree on certain issues and have an argument on the others; listen, understand and teach each other made me believe in feasibility of improvement of mutual relations between our countries. Since in the end, we are the same people, who have similar problems, complaints, aspirations and dreams; whilst conferences like this once again prove it to be true." Anna Rud, a native of Ukraine and an AU junior summed it up nicely: "If we talk to each other and get to truly know each other's culture, there is no way we cannot achieve compromise and get along even on the global arena. The future is ours and our generation is very ambitious to change the relations between Russia and the US in a positive direction and I think we can do it."